They are the drowned edges of continents. Covered by the oceans, continental margins are part of the same crust (thin, solid outermost layer of Earth) that forms the continents. They are covered in sediments that have been eroded from dry land. (Erosion is the gradual wearing away of Earth surfaces through the action of wind and water.) Lying between the deep ocean basins and the above-water land areas, continental margins account for 11 percent of Earth's surface. The continental margin is the submerged outer edge of a continent. It is generally divided into two sections: the continental shelf and the continental slope. The continental shelf is the region that extends seaward from the shoreline to a sharp drop-off that marks the beginning of the continental slope. That drop-off is known as the continental shelf break. Continental shelves vary in width from 3 to 930 miles (5 to 1,500 kilometers). The average width worldwide is about 40 miles (64 kilometers). The widest shelves are in the Arctic Ocean off the northern coasts of Siberia and North America. Narrow shelves are found off the western coasts of North and South America. Continental shelves along the coasts of the United States cover an area of about 891,000 square miles (2,307,690 square kilometers). Continental shelves are normally gently sloping, with an average seaward slope of about 0.1 degree. They tend to have the same topography or surface features that dominate the adjacent land. Whether a coastal area is mountainous, dominated by low hills, or flat, the continental shelf next to it will be similarly shaped. The average depth of the continental shelf at the shelf break is about 430 feet (131 meters) below the surface of the ocean. Basic composition of continental margins, which include the continental shelf, continental slope, and continental rise. In contrast to the continental shelf, the continental slope is generally narrow in width, ranging from 6.2 to 62 miles (10 to 100 kilometers). Relatively steeper than the shelf, the slope angles down to the ocean basin at an average of 4 degrees; in some areas, the angle may be as much as 25 degrees. The steepness of a slope often reflects the steepness of the nearby coastal area. Slopes along mountainous coasts are steeper than those along flat coasts. In general, the steepest slopes tend to be found in the Pacific Ocean and the least steep slopes in the Atlantic and Indian Oceans. The most distinctive features of continental slopes are submarine canyons. Typically, these are steep-walled, V-shaped canyons that may be thousands of feet deep. The incline of a canyon is normally related to that of the slope: steep slopes have short, steep canyons, while broader slopes have longer, shallower canyons. The deepest of the submarine canyons easily rival the size of the Grand Canyon on the Colorado River in Arizona. Sometimes, submarine canyons begin at the outer edge of the continental shelf. Most often, they form down-current from major rivers that flow into an ocean. Geologists believe that some submarine canyons may have been carved during a time in Earth's past when sea levels were lower than at present, and rivers were able to flow out to the edge of the shelf. Other canyons may have formed when earthquakes created faults or cracks along slopes that were subsequently eroded into the canyons. A mass of sediment and oceanic rock that is transferred from an oceanic plate to the edge of the less dense plate under which it is subducting. A continental margin that has a very narrow, or even nonexistent, continental shelf and a narrow and steep continental slope that ends in a deep trench instead of a continental rise; it is marked by earthquake and volcanic activity. The hypothesis proposed by Alfred Wegener that the continents are not stationary, but have moved across the surface of Earth over time. The submerged outer edge of a continent, composed of the continental shelf and the continental slope. The gently sloping, smooth-surfaced, thick accumulation of sediment at the base of certain continental slopes. The gently sloping region of the continental margin that extends seaward from the shoreline to the continental shelf break. The outer edge of the continental shelf at which there is a sharp drop-off to the steeper continental slope. The steeply sloping region of the continental margin that extends from the continental shelf break downward to the ocean basin. A continental margin that has a broad continental shelf, a gentle continental slope, and a pronounced continental rise; it is marked by a lack of earthquake and volcanic activity. The process by which new oceanic crust is formed by the upwelling of magma at mid-ocean ridges, resulting in the continuous lateral movement of existing oceanic crust. A region where two plates come together and the edge of one plate slides beneath the other. A steep-walled, V-shaped canyon that is cut into the rocks and sediments of the continental slope and, sometimes, the outer continental shelf. A long, deep, narrow depression on the ocean basin with relatively steep sides. A turbulent mixture of water and sediment that flows down a continental slope under the influence of gravity. At the base of certain continental slopes is a gently sloping, smooth-surfaced, thick accumulation of sediment from land that had been transported to the shelf and then down the slope. This transition between the continental slope and the ocean basin is known as the continental rise. Some sources include the continental rise as being a major section of the continental margin, along with the shelf and slope. Since it does not occur on all continental margins around the planet, it is best considered a characteristic of the margin in certain areas. Continental rises are well-developed around Antarctica and in the Atlantic and Indian Oceans. They are hardly found in the Pacific. When they are present, continental rises vary in width from 62 to 620 miles (100 to 1,000 kilometers). A continental margin that has a broad continental shelf, a gentle continental slope, and a pronounced continental rise is known as a passive continental margin. This type of margin experiences little, if any, volcanic or earthquake activity. The build-up of sediment is the primary activity affecting a passive margin. Because these margins are found along the east coasts of North and South America and the west coasts of Europe and Africa, they are also known as "Atlantic-type" margins. The continental margins along India and Antarctica are other examples of passive margins. A continental margin that has a very narrow, or even nonexistent, continental shelf and a narrow and steep continental slope is known as an active continental margin. Instead of ending in a continental rise, the continental slope of this type of margin often plunges into a deep-ocean trench, which may be filled with sediment. Earthquake and volcanic activity are prominent here. Since active continental margins occur along many coasts of the Pacific Ocean, these types of margins are also known as "Pacific-type" margins. The two types of continental margins, passive and active, tell about the geologic history of Earth and the activities that are continually affecting its surface. The continents are not stationary, but move about the planet's surface. That movement varies, but in general is extremely slow, only about 2 inches (5 centimeters) per year. Over millions of years, however, the continents have made their way along on an endless journey across the planet's surface, repeatedly crashing into or breaking away from one another. Continental shelves have not always been covered by water. During Earth's history, changes in sea level have alternately exposed, then covered portions of the shelves. Scientists estimate that during the last glacial period over 10,000 years ago, much of Earth's water was trapped in the polar ice sheets. The level of the oceans may have dropped as much as 350 feet (107 meters) below the current level. At times of low sea level, land plants and animals, including humans and their ancestors, lived on the shelves. Evidence of this lies in their remains that are often found there in the present day. Twelve-thousand-year-old bones of mastodons, extinct relatives of the elephant, have been recovered off the coast of the northeastern United States. Because water above continental shelves is not that deep, sunlight is able to penetrate, helping plants grow. This, in turn, leads to a rich web of sea life. Most commercial fishing takes place in these waters. Extensive deposits of oil, natural gas, minerals, and other natural resources lie beneath continental shelves. The economic benefit of the fish and natural resources is important to many nations, which claim territorial ownership of the continental shelves adjacent to their land areas. Many political disagreements have arisen because of this. In spite of their desire to reap the benefits contained over and in the shelves, many nations illegally dump much of their waste in the ocean over these areas. Wegener formed his hypothesis after he had observed that the present-day continental margins along some of the continents seemed to fit together like pieces in a jigsaw puzzle: eastern South America with western Africa, eastern North America with western Europe, and India and Antarctica with eastern Africa. When the continents are linked, some of their geological features, such as mountain ranges and mineral deposits, also match. In addition, related species of land animals are often present on both side of the present-day oceans. Wegener argued further that if the continents had drifted, they would have passed through various climate zones. This explains how evidence of past glaciers could be found in the Sahara desert region and why fossil coral reefs appear north of the Arctic Circle. What Wegener lacked, however, was a convincing explanation as to what moved the continents along the surface. Evidence to support his hypothesis did not come until the early 1960s when geologists developed the theory of plate tectonics (from the Greek word tekton, meaning "builder"). A revolutionary idea, it helps geologists and others understand how Earth has changed over long periods of time. Changes in the positions and features of the continents and oceans have had a profound effect on everything from global climate to the evolution of life. Simply, the theory states that the surface of the planet is broken into sections—some large, some small—called tectonic plates. As these plates drift slowly over Earth, they slide past, collide with, and move away from each other. The boundaries where the plates meet and interact are called plate margins. What moves the plates along occurs within the planet. 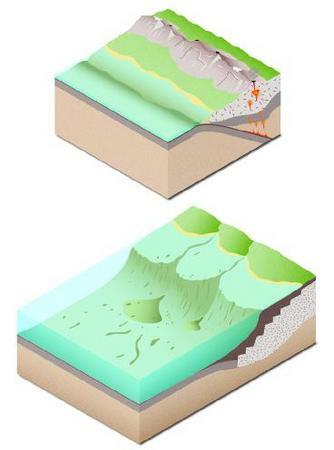 Geologists divide Earth into three distinct layers: the crust, the mantle, and the core. Each layer has its own unique properties and composition. As already mentioned, the crust is the thin shell of rock that covers Earth. Two types of crust exist: continental crust, which underlies the continents, and oceanic crust, which underlies the oceans. Varying in thickness, the crust is thickest below land and thinnest below the oceans. 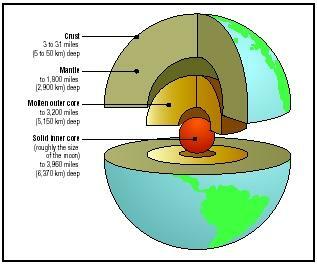 Cross-section of Earth's interior, with the solid inner core, molten outer core, mantle, and crust. enough to fold, stretch, compress, and flow very slowly without fracturing. It is puttylike in its consistency, or what geologists call "plastic." The rigid tectonic plates "float" on the more dense, flowing asthenosphere. The core, lying at the center of the planet, is divided into a liquid outer layer and a solid inner layer. Made up of the metallic elements iron and nickel, the core is almost five times as dense as rock on Earth's surface. Temperatures in the core are estimated to exceed 9,900°F (5,482°C), creating extreme heat energy. This heat energy moves the tectonic plates across the planet's surface. It is carried to the area beneath the plates by convection currents, which act similar to the currents produced in a pot of boiling liquid on a hot stove. When a liquid in a pot begins to boil, it turns over and over. Liquid heated at the bottom of the pot rises to the surface because heating has caused it to expand and become less dense (lighter). Once at the surface, the heated material cools and becomes dense once more. It then sinks back down to the bottom to become reheated. This continuous motion of heated material rising, cooling, and sinking forms the circular convection currents. Like a gigantic furnace, the core heats the mantle rock immediately above it. Expanding and becoming less dense, the heated rock slowly rises through cooler, denser mantle rock. When the heated rock reaches the lithosphere, it moves along its base, exerting dragging forces on the tectonic plates. This causes the plates to move. In the process, the heated rock begins to lose heat. Cooling and becoming denser, the rock then sinks back toward the core, where it will be heated once more. It takes an estimated 200 million years for heated mantle rock to make the circular trip from the core to the lithosphere and back again. As the plates move, they interact in several different ways. Where they diverge, or move away from each other, new lithospheric rock is created as magma rises up through the crust at the plate boundary and gradually begins to cool. Many boundaries of diverging plates are on the floors of the oceans. They are known as mid-ocean ridges, and the process of new ocean crust forming at the ridges is known as seafloor spreading. Where plates converge, or move into one another, either they crumple up and compress or one plate slides beneath the other. When two continental (land) plates converge, the crust bends and breaks from the collision, forming complex mountain ranges and very high plateaus. When a continental plate and an oceanic plate converge, the oceanic plate (which is thinner, yet denser) bends and plunges at an angle into the asthenosphere beneath the continental plate. As it does so, its leading edge begins to melt because of high temperature and pressure in the mantle. This forms thick, flowing magma (molten rock beneath the planet's surface). Less dense than the rock that surrounds it deep underground, the magma rises toward Earth's surface, forcing its way through weakened layers of rock. In most instances, the magma collects in underground reservoirs called magma chambers. It remains there until enough pressure builds up to eject it onto the planet's surface through vents called volcanoes. (For further information, see the Volcano chapter.) The process of one plate sinking beneath another is known as subduction, and the area where it occurs is known as a subduction zone. At about 10 percent of the plate boundaries, the plates neither diverge nor converge; instead, they transform or slide past one another. On land, such a boundary is called a slip-strike boundary. A classic example of such a boundary is the San Andreas Fault system, an area of cracks in Earth's surface that occurs at the boundary between two tectonic plates, which extends down the coast of California. Two types of continental margins exist: active margins and passive margins. Active margins form primarily along the boundaries of plates that are actively converging. Passive margins currently exist in the middle of plates, not at plate boundaries. the ocean floor. Tectonic activity continues along the rift, but seafloor spreading has moved the plates thousands of miles away from the Mid-Atlantic Ridge. Thus, the continental margins along these continents are considered tectonically quiet. Although they are the "trailing edge" of the continents, passive continental margins currently exist in the middle of plates, not at plate boundaries. Erosion is the primary force acting on them, having continually deposited sediment from dry land since their formation. In places along passive margins in the Atlantic Ocean, the sediment measures more than 6 miles (10 kilometers) deep. Because they are built seaward by the sediment, passive margins may also be called "constructive" margins. They do not fill completely with sediment because the underlying crust subsides or sinks into the soft mantle, providing additional room for sediment to accumulate. Active continental margins form primarily along the boundaries of plates that are actively converging and where one plate is sinking beneath the other. Active margins mark the continents that border the Pacific Ocean where oceanic plates are subducting beneath continental plates. These areas are sites of tectonic activity, such as earthquakes and the formation of large volcanic mountains. Examples include the Andes Mountains along the western coast of South America. Coasts along active margins are typically lifted upward by the subduction of the oceanic plate, forming terraces and cliffs that are eroded by the ocean's waves. The seaside cliffs on the northwestern coast of North America are such an example. The "leading edge" of a continental plate as it moves across Earth's surface, an active margin lacks a wide shelf. In fact, a shelf may not even exist. The margin's narrow slope may begin close to the coast, then angle steeply downward into a trench formed where the oceanic plate subducts beneath the continental plate. When the oceanic plate slips beneath the less dense plate, rock may be scraped from the oceanic plate. These scraps of oceanic crust accumulate with sediment to form what are called accretionary (pronounced ah-KREE-sha-nair-ee) wedges that build up on the landward side of the trench. The largest submarine canyon on the west coast of the United States lies in Monterey Bay just south of San Francisco, California. First discovered in 1857 and labeled a submarine gulch, Monterey Canyon rivals the Grand Canyon in size and complexity. Almost perfectly bisecting the floor of the bay, the canyon begins just off the shore in 30 feet (9 meters) of water. It then extends 60 miles (97 kilometers) out into the ocean, widening while dropping to a depth 2 miles (3 kilometers) beneath the surface. The steep walls of the canyon are lined with cliffs, ridges, crevices, and sediment-covered shelves. The canyon contains several smaller side canyons. Where it meets the ocean floor, the canyon opens and the sediment that has washed down through it spills out into a fan. Over its life, the canyon has been filled and refilled with sediment that has helped scour and erode the canyon's walls. Geologists believe the canyon formed 25 to 30 million years ago. The reason behind its formation is still debated. Some believe that the powerful outflow of an ancient river from the southern end of the present-day San Joaquin Valley carved the canyon when the river flowed through a gap in the mountains and into the bay. Since that time, the bay and the surrounding land has slowly moved northward along the San Andreas Fault to its present location. Other geologists believe an ancient earthquake opened a crack that was widened through the erosive force of turbidity currents to become the present-day canyon. "Basin and Coastal Morphology: Principal Features." COAST Resource Guide. http://www.coast-nopp.org/visualization_modules/physical_chemical/basin_coastal_morphology/principal_features/index.html (accessed on June 30, 2003). Coastal Processes and the Continental Margins. http://www.ocean.washington.edu/education/magic/Ipage/happened/2/coastal.htm (accessed on June 30, 2003). "Ocean Regions: Ocean Floor-Continental Margin and Rise." Office of Naval Research. http://www.onr.navy.mil/focus/ocean/regions/oceanfloor2.htm (accessed on June 30, 2003). Plate Tectonics. http://www.platetectonics.com/index.asp (accessed on June 30, 2003). what are associated rocks types characteristic of leading and trailing continental margin. its a funtastic feature i ever found on internet.it helps to understand all the continetal features encluding passive n active continental margins.. This article is so good, since it help me to fullfill my presentation. My request, my you use more examples from africa to modify this article,for example ivory-coast-ghana sheared margin. This is an amazing breakdown that assisted me in understand this section of my Oceanography class. Very well done, thank you! My daughter needs to make a module about continental margin for her school project. Can someone help us make an activity regarding this topic that is suitable for students? We highly appreciate your reply. Thank you in advance! I really like this site it is really helpful if you ever have science homework. Thanks very much for the Educative materials. Any one who can Explain to me Why our Continent is not worn out or Submerged by ocean after many years. This wasn't as enlightening as the Holocaust, it in fact has led me to believe that we as a species need to focus on more relevant topics. This helped me with my school studying. Thanks a lot! !